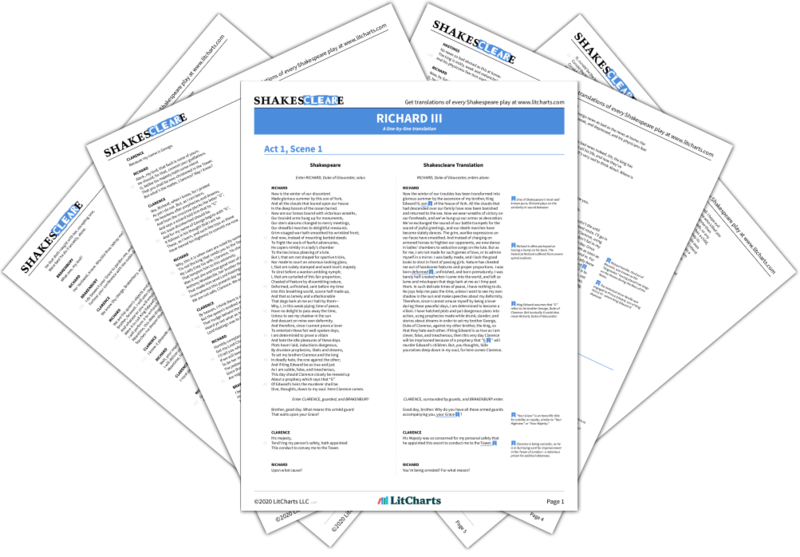 Instant downloads of all 942 LitChart PDFs (including Richard III). 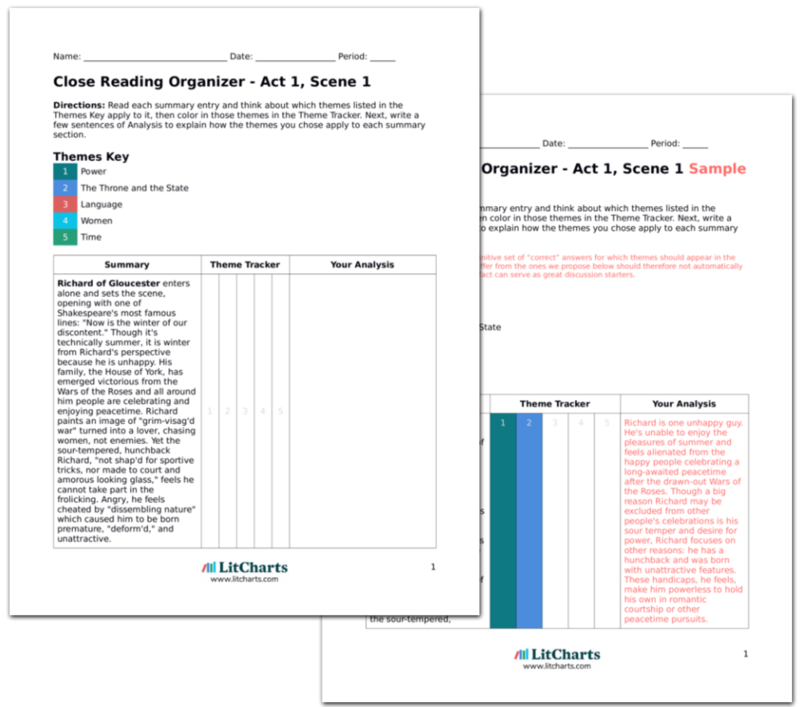 LitCharts assigns a color and icon to each theme in Richard III, which you can use to track the themes throughout the work. In the Tower, Clarence tremblingly recounts a nightmare he's just had to Brackenbury. Clarence dreamt that he and Richard were reminiscing about the Wars of the Roses while walking along the hatches of a ship crossing the Channel to France. Richard stumbled and hit Clarence, who fell overboard and slowly drowned, seeing the wretched wealth of shipwrecks and skeletons on the seafloor. Dead, he crossed the River Styx and met his father-in-law (a Lancaster supporter) and Edward Prince of Wales, who reprimanded him for treachery. Fiends surrounded him and their howling woke him from the nightmare. Clarence laments that his sins were committed for King Edward, yet Edward has imprisoned him. He begs God to spare his wife and children from any punishments he might face for those sins. He sleeps. Brackenbury reflects on the ephemerality of glory. Clarence may not be able to see through Richard's lies in waking life, but his dreaming self seems to know the truth. Indeed, Richard is trying to knock Clarence out of the picture, just as he does in the dream. Clarence's dreamed conversations in the land of the dead illustrate his guilt and frustration surrounding the English throne. He feels bad for betraying his father-in-law by supporting the House of York, but also feels frustrated that his loyalty towards the House of York and his brother Edward is not being duly rewarded. Brackenbury's thoughts, meanwhile, focus on how any quest—or even success—in gaining power will never last. It is a meditation on time and, in a sense, the entire sequence of the Wars of the Roses. The two murderers enter and present Brackenbury a paper saying they are to take over his guard. Brackenbury goes off to report the switch to King Edward. The murderers bicker about how to go about killing Clarence. The second murderer worries he'll be damned for killing Clarence and no longer wants to murder. The first murderer reminds him of the payment they'll receive for killing and the second murderer is swayed, dismissing conscience as something that "beggars any man that keeps it." Though the first murderer seems to have no trouble being the straightforward "doer" he promised Richard he'd be, the second murderer is much more of a talker. He thinks ahead to the consequences of his actions and debates with his conscience. Still, he thinks life would be easier if he didn't have a conscience. Clarence wakes and asks the two murderers if they are here to kill him. When they say yes, he tries to reason with them, telling them he's innocent and that they'll be damned for killing him by Christ, the King of kings whose will overrides King Edward's. When the murderers call him a traitor, Clarence protests that he switched sides in the Wars of the Roses entirely for his brother's sake and thus Edward can't order him murdered for that. When Clarence tells the murderers that Richard will reward them for sparing his life, they reveal that Richard himself has ordered the death, which Clarence can't believe. "Relent, and save your souls," he cries. The first murderer stabs Clarence dead. The second murderer, distraught, wishes they had spared Clarence and tells the first murderer to take the full payment for the deed since he himself repents. He exits. The first murderer calls the second a coward and exits to hide the body. As Richard feared, Clarence proves himself a persuasive speaker. His argument, though, appeals to the murderers' consciences and thus only the second murderer (who was already wrestling with questions about the potential consequences of murder before Clarence woke up) is ultimately persuaded. The first murderer kills Clarence as planned and is not tormented by the doubt and self-questioning plaguing his partner. He considers such struggles of conscience cowardly. Even though the murderers tell Clarence it's Richard who has masterminded his death, Clarence can't shake his faith in Richard's promises. He believes Richard's deceptions even to the end. Ross, Margaret. "Richard III Act 1, Scene 4." LitCharts. LitCharts LLC, 17 Nov 2013. Web. 18 Apr 2019. Ross, Margaret. "Richard III Act 1, Scene 4." LitCharts LLC, November 17, 2013. 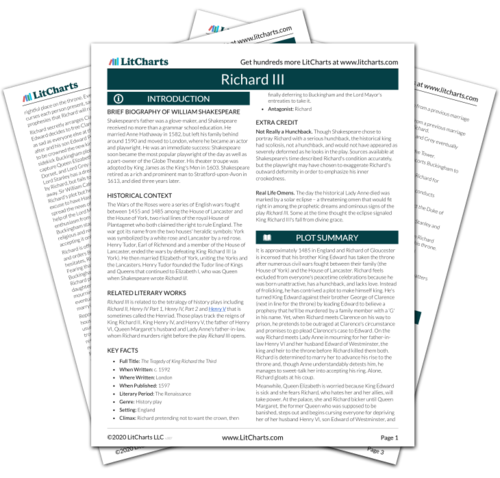 Retrieved April 18, 2019. https://www.litcharts.com/lit/richard-iii/act-1-scene-4.